glass chicken christmas tree ornaments: perhaps the best and most fun ornaments ever created! looking for our super popular hand-crafted chicken tree ornaments? crazy about chickens? love christmas? imagine you can have both with our popular chicken ornaments! a customer favorite; our lovely set of adorable chickens is ready to come to your home to roost. designed by our country raised city dwelling staff; each ornament consists of a matching white/red twine that adds a touch of modern country-cottage to their design. this high-quality christmas tree ornament set makes a great display on any tree. they make a lovely gift too. in fact; we have them hanging around at the office year-round since we love chickens, chicken coops and the fresh eggs they lay shortly before noon. 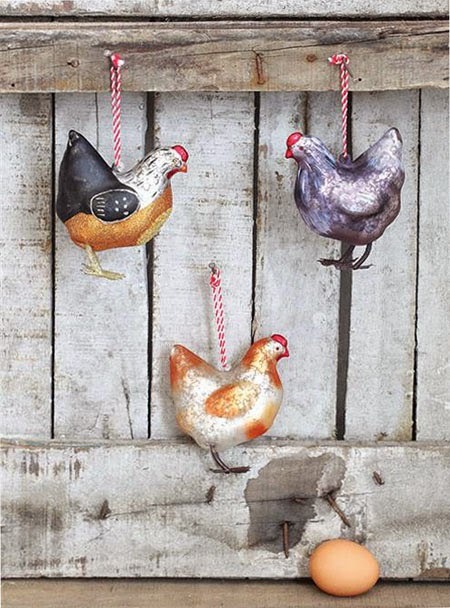 price is for the set of 3 (three) chicken ornaments as pictured! makes a fantastic ornament gift idea for ex-country people, chicken-missers or everyone that loves to keep chickens but doesn't have room for a coop.